Cold EI is the Electron Ionization (EI) of vibrationally cold molecules in Supersonic Molecular Beams (SMB) as obtained with the Aviv Analytical 5975-SMB GC-MS with Cold EI. For more details on Cold EI please visit the Aviv Analytical website or read the review article of A. Amirav, A. Gordin, M. Poliak and A. B. Fialkov "Gas Chromatography Mass Spectrometry with Supersonic Molecular Beams", J. Mass. Spectrom. 43, 141-163 (2008) (available on request). In Cold EI the abundances of molecular ions are enhanced and while the degree of enhancement is small for small molecules with low internal heat capacity, it can be substantial for large molecules and for those that exhibit low molecular ion abundance in standard (classical) EI such as hydrocarbons and particularly large hydrocarbons (see our previous post). In this post we show how enhanced Cold-EI spectra affect the identification results of NIST library searches. As shown in Figure 1 below at the third trace the classical EI mass spectrum of n-C20H42 is characterized by a tiny molecular ion with relative abundance of 1.6% while it is the dominant ion in Cold EI as shown in the second trace mass spectrum. Such large enhancement of the molecular ions of about two orders of magnitude (we measured it as 90 for n-C20H42) is of immediate practical importance but often raises the question of "how does it affect NIST library search and identification?". The somewhat surprising answer is that as shown in Figure 1, the enhanced abundance of the molecular ion often improves NIST library identification and provides higher correct identification probabilities. As shown in Figure 1 while the Cold EI matching factors are lower (787 vs 957 in standard EI) the resulting Cold EI identification probability of 87.1% is much higher than the 35.3% of standard EI. We sum it up with the phrase "lower fit but better hit" since the correct molecule is higher in NIST's hit list with an improved identification probability. One of the main reasons for this observation is that for hydrocarbons the molecular ion is the only characteristic ion while the fragments are shared by many or most hydrocarbons. Thus, Cold EI enhances the only compound specific ion and distinguishes it from all other possibilities. Accordingly, while in standard EI the matching factors are high, they are also high for many other non sample hydrocarbons. In contrast, in Cold EI the matching factors for non sample compounds are very low. 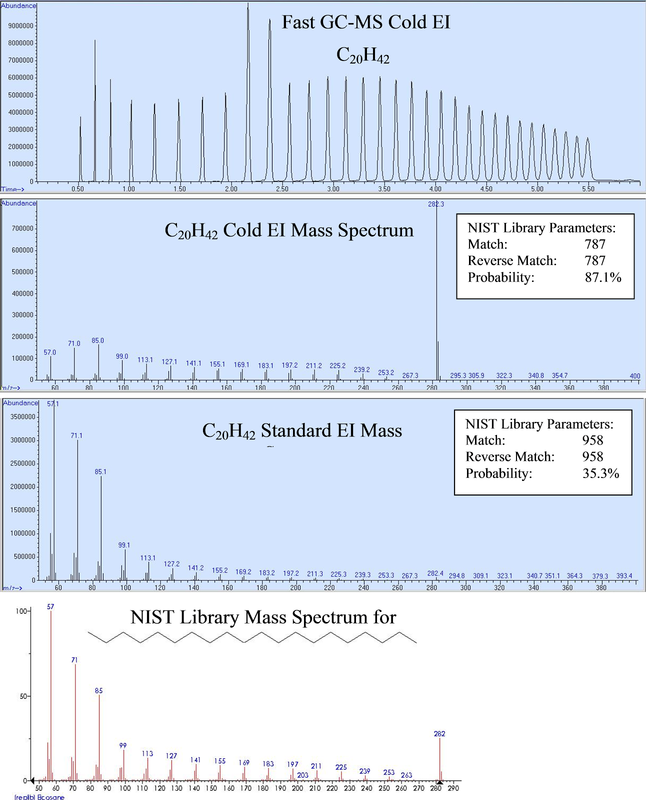 Another important reason is that the NIST library contains mass spectra that were donated by MS users that strived to obtain good molecular ions for having high quality mass spectra. Thus, they kept the EI ion source at a relatively low ion source temperature such as 150°C which resulted in much higher relative abundance of the molecular ions than in practical GC-MS applications. For example, in the analysis of our mixture by standard EI, the need to elute a hydrocarbon mixture all the way to C40H82 dictated the use of ion source temperature of 250°C with the result of having lower relative abundance of the molecular ions compared with the NIST library, as shown in Figure 1. This observation is widely known and Figure 1 only demonstrates it again. Thus, while Cold EI enhances the molecular ion standard EI often provides reduced molecular ions compared with the library and the final result is that Cold EI not only provides very good sample identification, but its identification probabilities are often superior to those obtained with standard "classical" EI. 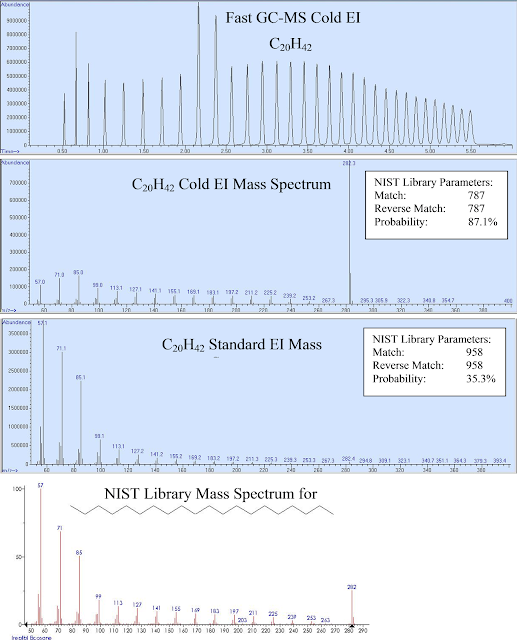 We also note that for routine applications one can add the Cold EI mass spectra into the NIST library and obtain very high matching factors in future analyses. Finally, in view of its enhanced molecular ions Cold EI is better compatible with the Tal-Aviv Molecule Identifier (TAMI) software that is based on isotope abundance analysis. 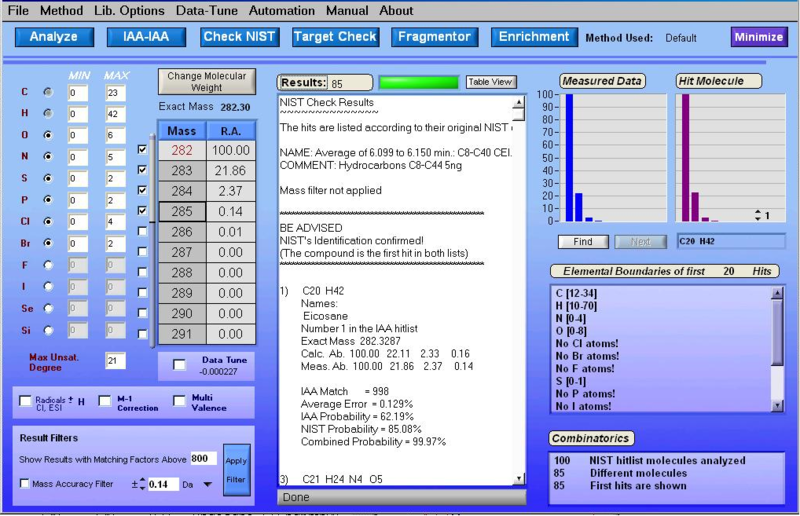 The TAMI software automatically confirms the NIST search results (if they are correct) and when a compound is not in the library it provides a list of possible elemental formulas with a declining order of matching factors as in costly high resolution MS. The combination of TAMI and NIST library is especially effective as it results in unambiguous identification due to the use of two independent search algorithms. In our case of n-C20H42 the TAMI software confirmed the NIST identification of Cold EI MS with a matching factor of 998 (out of 1000) and the combined TAMI-NIST identification probability was 99.97% as shown in Figure 2. While the TAMI software can also be used with standard EI the low abundance of the molecular ions reduces the achieved matching factor which was only 969 in standard EI. In summary, Cold EI provides "lower fit but better hit" to NIST library search results. I was actually planning on asking about this on the previous post, as this seemed a bit counter intuitive to me at first - It does make sense now. I really enjoyed some of the posts in this blog, you make some very informative points. Keep up the great work!